Christmas is fast approaching and we wouldn’t want to miss the chance to surprise our family and relatives especially our kids and the young ones. It is one of the most awaited holidays of the year and every family in most countries celebrates it. The feeling we get if we can grant our children’s wishes is the best there is. Most of the time, kids will ask you or Santa a play set or a toy. Some asks for a perfect Christmas train set up inside or outside the house. A great way to add flavor to whatever decoration you plan for that holiday is a Christmas train set. Christmas train is the most memorable play set or decorations you could have for a perfect Christmas holiday. It is not only the best to from where you can develop a memorable childhood memory for your kids but as adults, it also gives us a nostalgic feeling about dozens of Christmas events we have encountered in the past. We most certainly want to pass down that happy feeling and nice memories to our children and our children’s children. By doing this, it could nurture our children’s development and inspire them to have a positive outlook in life. The most common train that we can relate to our Christmas memories is the Polar Express train. Every time we hear about it, it brings us back to the time where the movie came out. Hearing it creates a flashback of our different Christmas train rides. It reminds us that once in our lives we had an awesome Christmas experience and this time, it is for the younger generations to experience the same feeling, a fun, entertaining, exciting, adventurous and interactive way to develop our children. Trains are not only there to create good childhood memories but also to help children learn while having a good time. The trains aids in the development of our kids through interaction. This is actually more of a developmental toy for kids. A Christmas train can either be a play set, a decoration or a collector’s item. Whatever the purpose you are looking for, the best thing to do is to conduct some research, get yourself people’s opinion or check on different forums and seek advice. The reason would be to find the best train model that suits you or your kid’s needs. It is more practical that way. You wouldn’t want your 12 year old child to have a Christmas train that doesn’t even move or a train that got low quality details. Look for a train that could entertain you, your guest, relatives and children for that specific holiday. Always look for a product that not only fits your budget but also gives the right value, purpose and worth your money deserves. There are so many known company or manufacturers that produces high quality train products and play toys for starters or beginners, intermediate train lovers and collectors. Below are the lists of the best train products. 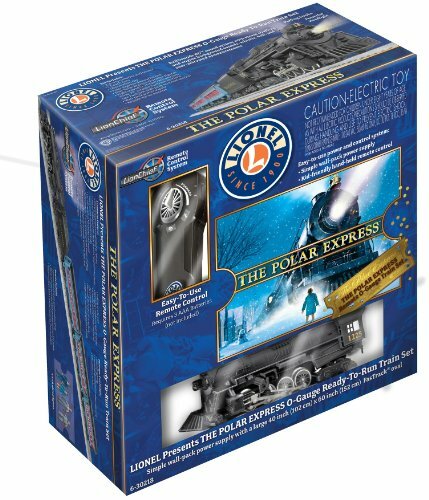 The Lionel Polar Express train series is the most well-known train sets best suited for Christmas. It is the train designed based and featured on the movie “The Polar Express” back in 2004. This is why kids and young adults in this generation tend to get nostalgic upon seeing a train pass by. This Lionel Polar Express Train Set is available and comes with a remote control operation features. It is for the first time in Lionel O gauge trains. Both young and adult train conductors can now have complete control over the train’s movement. It is an easy-to-use remote control. This train set is both applicable to young children aging 8 and up, young adults and train enthusiast or collectors. The quality and the detail are both in a superb level. This train set can last longer compare with other train sets even if it’s used very often. This train’s engine car is motorized. It weighs about 17 pounds. You can actually tell that the train is strong and sturdy. .It is a ready-to-run or out-of-the-box train set. The train requires minimal effort in assembling. It can run on its track right away. This train set have amazing sound effects. The official “All aboard the Polar Express” and some sound clips from the 2004 “The Polar Express” are included in the sound effects. The engine car puffs or emits smoke. It is like a miniaturized real train. Included in the set is a flexible but strong train tracks that can hold the train firmly preventing it from derailing. The voice on the sound features of the train is very clear. Intensive use does not even affect its quality. It is an electric train but it requires 3 pieces of triple A batteries for the remote control. The remote control has it all. It can make the train move forward, reverse, sound setting, talk, blow horns, whistle or chug. Its smoke stacks have a nice emission. You just need to read the manual on how many drops it requires to function efficiently. The train is made of high quality materials and very well combined or connected. Its details in each part are very sharp. It is a very expensive Lionel train set. You would think twice to buy this train set for an 8 year old kid. Rough play or heavy beating can damage the train and you’ll just be wasting your money. Puff or emissions of smoke won’t come out if you put too much liquid. The quality control is not that good. Make sure that when you buy this on stores or websites, they have a return or exchange policy. This is one of the Christmas train you would want running around your Christmas tree or your train table during the Holidays. The sound effects create a Christmasy ambiance around the room. It is also a pretty nice entertainment for your guests, relatives and children. Your kids will have a great time coming out from their room and catch the train running around a tree full of presents. This is the limited edition Lego Christmas Theme train set. Gather around your family during the holidays for a family festive Lego fun. This is a great Christmas train for you and your kids because it gives you the opportunity to bond with your children by building the blocks to create the train’s set up. There are countless ways to build your own winter theme but a guide or a manual is also included if you prefer to follow the default set up. Lego is known to create a wonderful and exciting play sets that promotes your kids creativity and imagination. Connecting and building up blocks and train pieces with this set will help your children develop great skills. The set includes 734 pieces of train parts, figures, blocks and accessories. It also comes with a flatbed, wagon, a rotating tree, toys and gifts to celebrate more Christmas fun. The train is not motorized but it is already set up or built to be motor up-gradable. This is the perfect Christmas train set for your kids this holiday, a great train that grants your kids fun and learning. The set have 5 miniatures that include a boy and a girl, a train driver, grandmother and a ticket collector. It comes in with 16 pieces curved tracks that are fairly wide. The set also includes an engine car which ready for a motor upgrade, a holiday tree on a flatbed wagon, caboose, boarding platform, toys and gifts. This goes well and neat under a Christmas tree or on top of a train table. The tree rotates as the train moves. The price is just right with the amount if pieces the Lego Train set has. Your kids will have a great time connecting the pieces and trying to be creative. It comes with a well-illustrated manual if you or your kids plan to use the default design. At any point that you want to put an motor engine, the train engine is already motor ready. It does not have any movements on its own. The train set does not include a motor or a remote. This is not advisable for kids aging 7 and below (choking hazard). The train does not run smoothly on the track. It is a bit loose and the tracks are not that sturdy. The Lego Winter Holiday Train 10254 is a great set to add if you already have several Lego Train Themed collections. This is also a great set during the Holidays or on Christmas. You and your kids will enjoy a moment of great bonding setting up the Lego blocks to build your winter train. If you plan on trying to upgrade its mobility, the train engine car is already curved and design to cater several kinds of motor as it is written in the manual which is included upon purchase. This is a great train set with high rates and hopes that is worth your investment. Just for fun and for a possible layout reference – Here is a video of a Lego Christmas Train. The blocks design of Lego actually opens your children’s imagination to a whole new level. There are countless possible layout they can create with this set. 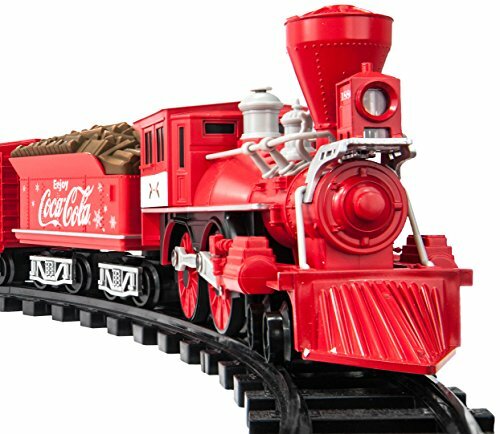 This is another wonder train from Lionel in partnership with Coca-Cola. The Lionel Trains Coca-Cola Holiday G-Gauge Train Set is a combination of two things our kids and us loves. It is a G-Gauge Train colored up, designed and detailed with Coca-Cola labels and drawings of Santa Clause drinking it. This is something new for Lionel Company, two Iconic brands teaming up to bring more fun during Christmas holidays. This Christmas train is a G-Gauge train made in the US with imported parts and materials. The production of this train set is limited. It is made to give a historic Christmas holiday to inspire family traditions and give happiness to your children in years to come. The train set includes train tracks, a motorized locomotive engine car, a Coca-Cola billboard, boxcar, tender and a caboose. This is also like any other Lionel trains. It just differs with the design and details of the each train cars. It is a high quality electric train set with remote features. This train set has a working and bright headlight. It produces authentic sound that includes bells and whistles. The boxcar has opening doors on the side. Its remote features can control the sound and can make the train move forward and reverse. The set includes a center Cupola Caboose, Coke General Style Locomotive, tender and a boxcar. It has a bright red colors and high detailed Coca-Cola design. Each of these two companies are known to be loved by us and our children. This is a perfect combination of the things we like giving your more fun and entertainment. It is an electric train. This can circle freely around its tracks and can be controlled remotely. The remote control got a nice movement feature. It can go forward, reverse and even control the sound settings. This is the perfect Christmas train set to go under your Christmas tree. The whistling sound and the red Coca-Cola design will look very joyful in your living room. The materials in each train pieces are of great quality. The power consumption is very high. It burns up batteries so fast. Its remote control’s range is about 1 meter only. The track is not that strong to hold the train well. The powered engine is not that strong compared to other Lionel model train products. You can always live up with the Lionel Train standards. It never gets to disappoint you with their toy set production. The Lionel Trains Coca-Cola Holiday G-Gauge Train Set is one of its wonderful creations. Both companies (Lionel and Coke) have made this train set possible and it worked out very well. It gives a Christmas ambiance like no other train sets. This is a product worth collecting, purchasing and keeping to further the fun and entertainment of you and your kids on the holidays. The Mota Christmas Holiday Train is one of the best and top sellers in the market. This is one of a kind train set that will give splendid hours of fun and learning. It keeps your friends, family, children, guest and loved ones entertained during the holiday gathering. This is best for kids aging 14 and up. It is a classic toy train, a battery operated locomotive train. It puffs out real smoke and creates authentic train sounds, all these and more features for a very reasonable price. This is a perfect gift for an entire family, for your children, for your friends, train enthusiast, collectors and hobbyist. You can really put a smile one someone’s face with this train set for a very reasonable price. It includes a motorized train engine, an easy-to-build train track and cargo carts. This is an out-of-the-box train set. It is very easy to assemble and connect making the fun instantaneous the moment you take it out of the box. This train set has been featured so many times on “Fox and Friends“. It is a signature train locomotive product. It produces nice chug sound around the tracks. It makes whistling sound when it runs through the tracks. The cargo cars are very wide. You can put small gifts or stocks inside. MOTA company have a dedicated customer care that is rated 5 star. You can easily ask assistance. It creates a warm Christmas atmosphere around the house as your kids runs towards your Christmas tree to see Santa’s presents. It’s not an expensive train set. You can easily afford it. It makes perfect gift for your family, relatives or children. This train set is a good train collectibles for train hobbyist. It has a motorized battery operated train engine. You can enjoy longer hours of fun with this train. There is a smoke that puffs out of the train head. The strong and sturdy tracks are included in the set. It has no remote control feature. It can only move forward and runs on a standard speed. The train set is very delicate. This is not a train set for kids who plays roughly with their toys. You need to buy the liquid smoke goo separately. The train and the tracks do not fit well. It tends to derail. The MOTA Classic Holiday Train Set is a great set for Christmas holidays. It is not an advisable train for very young kids because it is slightly delicate. The battery powered engine works smoothly. It is inexpensive for the fun and feature it gives making it a very practical purchase. Your family and kids will have a good entertainment over the living room as you guys watch the train move around your Christmas tree. It is a high rate product which possibly made it one of the best sellers. Great things come in small packages. The Backmann trains are certainly the best when it comes to the Spirit of Christmas. 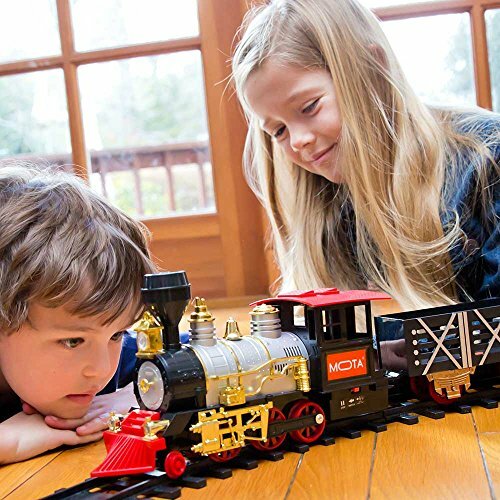 Backmann trains are one of the oldest companies that manufacture toys and play sets since 1833. They are very well known in the toy making world. The credibility they hold in creating festive train play sets is highly regarded. The trains they make are perfect on their tracks, highly detailed, strong and sturdy. Their products are also known to last long. 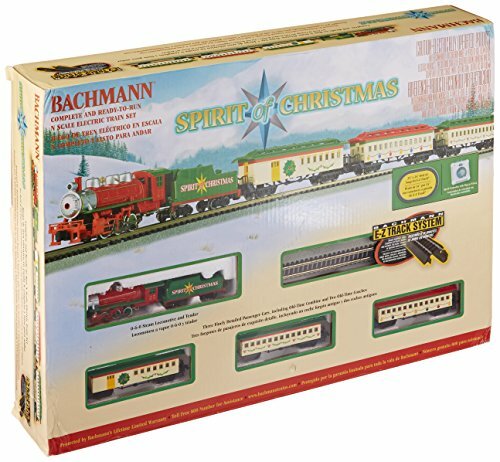 The Bachmann Spirit of Christmas Ready To Run Electric Train Set goes perfectly under the tree. It is festively decorated for a happy, enjoyable, entertaining Christmas for you and your family. This can also be a good gift for your friends, nephews, children and relatives. It is a ready-to-run out of the box train set. The box includes a very detailed manual. It requires you minimal effort to make the train run. This train set has a motorized engine and a remote controller for long hours of joyful Christmas fun. It has a 34 inch by 24 inch oval E-Z train track which is included in the set which is consist of 12 curved tracks and 4 straight tracks. The train is power packed. It is an electric powered train with a remote control. You can choose to move it forward or reverse or control its speed from low to high. This is ideal and friendly for first time train users. It is a good starting train if you want to start your train experience this Christmas holiday. It comes with a great guide that makes the set very easy to assemble and the tracks to connect. The set includes an electric powered engine car and 3 passenger cars all with Christmas spirit decorations. It goes perfectly with other Christmas ornaments. The perfect green Spirit Christmas Train for your Christmas tree. The train track holds the train perfectly. It keeps the train running smoothly. Unlike other trains, the remote control can make the train move in both directions and has a huge speed range option. This is a good choice for people who decided to start their train collection. The train wheels got no resistance or traction. It does not stop right away. It’s not that detailed compared with other Bachmann train sets. The train cars are slightly difficult to attach. Train tracks can hold the train well but it is hard to connect each other. If you are planning to buy one, this is will be a perfect purchase for you. This is an affordable Bachmann train set that is intended to give happiness and entertainment to you and your family for Christmas. It is a great train set to where you can start your wonderful train journey. This is train set is highly recommended. It has high rates, good reviews and many positive feedbacks, a Christmas train deserving to have.